The traditional favorite among stockmen. Long rounded teeth for quick, smooth combing, superb hair separation. Will not cut or pull the hair. 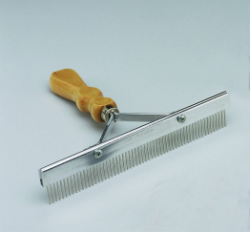 Sturdy, lightweight 58 needle design features 1/8” blade separation for quick combing and superb hair separation.